Whenever you move, whether it is to run a marathon or pick up a book from the floor, the discs lying between the vertebrae, or bones of your spine, are supposed to cushion the bones of your back and allow smooth, painless movement. However, discs wear out and cause pain, as evidenced by today’s epidemic of back pain. The disc, made 90% of water, begins to degenerate and dry out at 30 years of age. They lose volume, and therefore height, and become brittle. The loss of height results in the vertebra coming closer together, wearing down the facet joints connecting them, causing pain. 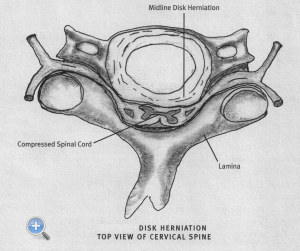 The shrinking disc also permits the vertebra to begin slipping over each other. This anatomical degeneration in turn results in changes within the spine which produce narrowing of the canal in which the nerves reside, as well as the holes via which they exit the spine and course into the body. This narrowing is called stenosis. The slippage, if it becomes significant, results in acquired scoliosis and spinal instability. The degenerating disc may also tear and some of the interior of the disc may herniate or ooze out of the disc, pressing on nerves going to the leg or arm, causing pain, weakness, or numbness. Alternatively, the covering of the desiccated disc can fissure or tear and result in discogenic pain described below. Unfortunately, disc degeneration cannot be prevented entirely with lifestyle modification. It is influenced by lifestyle—weight, physical labor, and biomechanically stressful exercise, as well as your genetics. A healthy disc is shaped like a plump checker piece. It contains a nucleus, or rubbery core, and has a leather-like covering called the annulus. As we age, the rubbery nucleus begins to dry out and it and the surrounding annulus become brittle and may crack. The annulus has pain sensitive nerves in it and as the disc degenerates, these nerves can grow into the nucleus. These nerves can transmit pain impulses from a degenerated disc to the brain. This type of pain is called discogenic pain —emanating from a degenerated, painful disc–and this section of the website is devoted to relieving it. This condition is highly over diagnosed—most back pain, like most neck pain, that does not involve the legs or arms, is due to painful facets or the joints connecting the vertebra, or muscles (see “Muscle Pain” and “Spine Related Pain” in “Specialties” section). However, for those suffering from discogenic pain, the treatments available are multiple, but many remain inadequately substantiated and are either often not covered by insurance or, as in the case of well reimbursed surgery, may not even relieve your back pain, but instead make it worse. 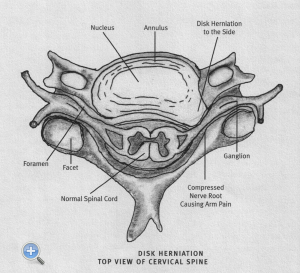 Another mechanism by which discs may cause pain is a herniation, whereby a piece of the nucleus may ooze through a tear in the annulus and compress a nearby spinal nerve. A true disc herniation may also cause weakness, numbness, and, in extreme cases, possible dysfunction of the bowels and bladder. Patients who experience unremitting, severe pain or other problems due to disc herniation may be better treated with open surgery. (See “Surgery” section). Both conditions (discogenic pain and disc herniation) can cause significant chronic pain in the neck, shoulder, arm, back, and legs. Some degenerated discs in the uppermost neck may cause or contribute to headaches. Many cases of discogenic pain resolve within two months—the tear in the annulus heals. Similarly, 70% – 80% of herniated discs resolve over two-to-three months, with a resolution of symptoms (See the section on “Spinal Surgery” and on “Specialties“). In selecting procedures for potential patients that are designed to relieve discogenic pain, one or more discs must be shown to cause disc related pain. Discogenic pain is deep, usually on both sides of the spine, and may radiate into the upper legs or, for disc related neck pain, into the shoulders and occasionally the arms. However, true sciatica, or the neck equivalent, usually does not exist with discogenic pain. 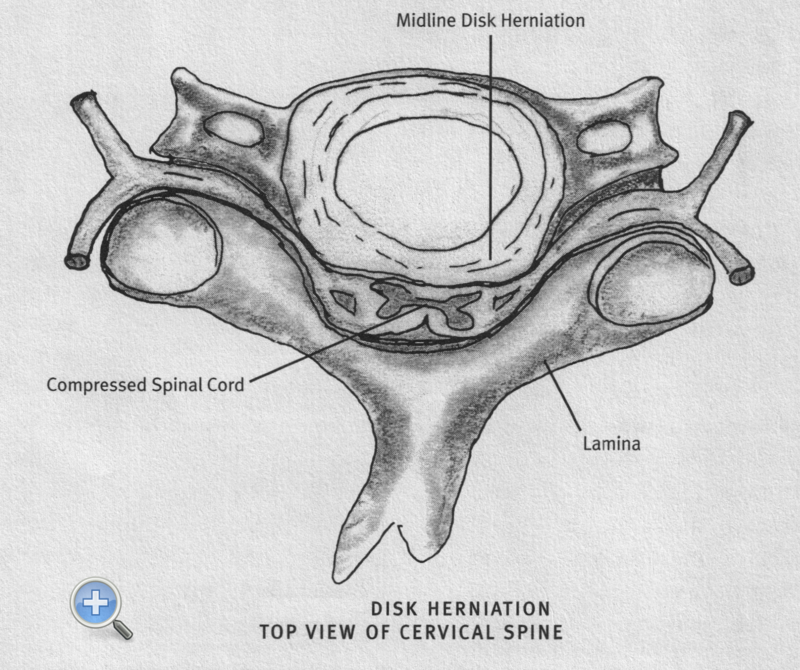 Disc related pain, like much spinal pain, is far more common in the lumbar spine than the neck. It may disturb sleep and may become worse with various daytime activities—sitting, bending, arising from bending, walking, standing, and lifting. The spinal muscles usually have little spasm in this condition, but pain may impair range of motion. It may co-exist with more superficial facet pain, however, and that may (in turn) co-exist with superficial tenderness. MRI images may suggest discs can prove to be painful—discs which cause pain usually have a tear in the annulus which can be seen on an MRI. However, not all discs with tears are painful. Patients with suspicious looking discs on an MRI and a clinical history and examination suggesting some or all off their pain may be related to one or more degenerating discs, must be evaluated with a special study known as a discogram. A discogram involves a small amount of liquid—X-ray dye and local anesthetic — being carefully instilled into various discs through a thin needle. Fluoroscopy, or in my case, CT guidance is used to permit visualization of the target disc and needle, so the needle can be safely and accurately guided into the disc. The discogram is an outpatient test under mild intravenous anesthesia that may take several hours to perform. 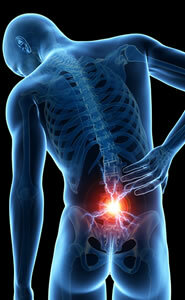 During the procedure, you and the doctor performing the study will determine which disc contributes to your back pain. When performed properly, it should not be painful other than some transient, mild-moderate pain produced when a painful disc is tested with the injection. When a normal disc is injected, the patient typically feels some mild pressure. Some injected discs produce pain, but not the pain the patient experiences in everyday life. Only a carefully performed discogram can determine whether or not a disc is painful and whether or not the pain produced by injecting the disc truly replicates a patient’s daily back pain. Only in the latter case should a disc be considered a candidate for treatment for discogenic pain. Many degenerated discs cause no discogenic pain, despite how terrible they may look on MRIs or CT scans. If a disc is found to be a culprit causing discogenic pain, it may be treated for this condition on a day following the discography procedure. The procedures to treat discogenic pain discussed below are all performed on an outpatient basis, using local anesthesia or local anesthesia combined with mild sedation, with the patient returning home relatively soon following the procedure. There is little post operative discomfort. Most of these procedures are performed under fluoroscopic (X-ray) guidance. I use CT guidance as I am familiar with using this technique, am fortunate to have access to a scanner for my procedures, and realize it provides far better visualization during the procedure, maximizing accuracy and safety of the needle placement from the skin into the disc. All these procedures for relief of lumbar or low back pain are performed with the patient lying on the stomach, are performed in a sterile fashion, and the electrodes or devices designed to achieve the therapeutic effect are inserted into the skin of the lower back, from a position off the mid line, and directed into the disc using the assistance of the radiological devices described above. Procedures on disc in the neck are performed with the patient lying on their back and the disc is approached from the side of the throat. Not all therapies for discogenic pain are performed on the neck—most are utilized only in the lumbar spine, the area most usually involved in the majority of patients with discogenic pain. Intradiscal Electrothermal Neurolysis, or IEN, is the name I have given to one minimally invasive technique I developed and use to treat the pain emanating from degenerated, but not herniated, discs causing discogenic pain. This technique uses radiofrequency energy to create a small area of heat surrounding thin electrodes inside a disc, each heated multiple times at various locations within the disc. Each time the electrode is heated, presumably it results in a lesion—total or partial destruction of any nerves within the inner disc covering or annulus, as well as the nucleus or center of the disc. Given this explanation for how the procedure may work—and it is not certain exactly how it does–the result of a successful IEN, as I perform it, should be a disc with less nerve fibers capable of delivering pain impulses generated within it to the brain. Neither IEN nor its competitors described below modify the degeneration of the disc. 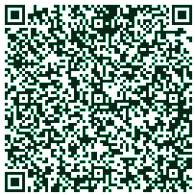 They all may cut the lines of communication relaying pain messages between the degenerated, painful disc and the brain. Most patients treated by me using IEN achieve years of pain relief with significant increased functional ability and the need for little, if any, prescription or even over the counter medication. The procedure takes several hours, is not painful, and is performed on an outpatient basis using mild intravenous anesthesia. Patients with successful procedures should be back to work within a few days. I have treated 29 patients with documented discogenic pain with IEN. At least 70% of patients with one painful disc have obtained years of pain relief. As the number of painful discs increases to three, the success rate declines to 50‑60%. The technique I use – IEN- is a modification of a technique invented by Menno Sluijter, MD (the Dutch father of radiofrequency) which he used in pain relieving procedures. His procedure today is called percutaneous intradiscal radiofrequency thermocoagulation (PIRFT). It uses only one electrode, whose tip is placed centrally within a disc shown to cause the patient’s pain on discography. The single electrode is heated at a lower temperature than with my technique, only once, and only at one central location. That procedure has been shown to be ineffective—presumably because of inadequate lesioning of the nerves within many areas of the disc. The IEN is successful in the patients on whom I have used it presumably because I utilize multiple electrodes, lesion multiple sites within the disc, including the periphery of the nucleus and the inner annulus, at a higher temperature and for a longer period. In short, my procedure apparently permits more widespread damage or destruction of the nerves within the disc—nerves which do not naturally exist until the disc begins to degenerate, but once within the disc may contribute to discogenic back pain. There are other thermal intradiscal procedures being used including: intradiscal electothermal therapy (IDET), intradiscal biacuplasty (IDB), nucleoplasty (percutaneous disc decompression or PDD), and percutaneous laser disc decompression (PLDD). The IDB and PDD, like the PIRT and the IEN, utilize radiofrequency energy to achieve heat generation. The IDB uses two radiofrequency electrodes within the disc to lesion nerves within the disc, and circulating water to cool tissue near the disc—presumably avoiding injury to the nerves outside the disc supplying the legs. In the IDB procedure, the electrodes heat only the disc material surrounding them in one location, unlike the IEN. The PDD uses a multifunctional device into the nucleus. It uses radiofrequency energy to destroy parts of the nucleus, creating channels within it. This procedure is thought to reduce outward pressure on the annulus and any nerve roots outside the annulus being compressed by a bulge of the disc. Of course, it is also possible that this procedure may lesion nerve fibers within the nucleus resulting in potential reduction of discogenic pain, in a manner independent of pressure reduction on the annulus. The IDET uses a heating element like a curved, flexible toaster wire to heat the annulus, presumably heating and destroying nerve fibers within the inner annulus, and also making the disc material more resistant to fissures, and seals small tears in the annulus. The PLDD uses one laser probe inserted into the central portion of the disc and a second inserted on the opposite side of the disc. Parts of the internal disc–the nucleus—are removed for pathological examination and some of the remaining disc material is vaporized using the laser. Like the PDD, the PLDD procedure is based on the assumption that by reducing the volume of the nucleus, outward pressure on the annulus is decreased, any bulging parts of the disc will be reduced in the size of the bulge, and discogenic pain will decrease. Similar to the explanation for the mechanism underlying therapeutic success with the other methods discussed above, it may be that the laser causes lesions of the nerve fibers within the nucleus with resultant reduction in discogenic pain—a purported mechanism independent of any internal pressure reduction within the disc. The results from treatment with IEN, as applied in my practice, compare quite favorably with those of its competitors and it relieves pain faster than IDET. Most procedures for the treatment of discogenic pain seem to work moderately well in properly selected patient as reported in small studies, all of which have certain methodological flaws, making the data less than totally reliable. Specifically, there exist no large, well-designed (randomized and placebo-controlled) academic studies that demonstrate the true long-term efficacy of any of these procedures. The risks from these procedures – disc infection or a small herniation of the disc through the hole through which the need passes into the disc– occur in less than 1 in 1,000. In the vast majority of cases, there are no long-term side effects. What is the main alternative to the above procedures? Surgical fusion of the spine, in which one vertebral body is fused or bonded to another, or to the pelvis, is another treatment advocated by some physicians for the type of low back pain addressed by IEN and similar procedures. Two vertebra connected by a disc are considered a joint of sorts. One method to treat pain emanating from a joint is to fuse the joint – if it can no longer move it cannot cause pain. As you will read below, fusions are not an ideal treatment for back pain as they typically substitute permanent pain resulting from the fusion for the original back pain, not to mention that a fused patient will require further surgery at a later date, as noted below. In general, discogenic pain, in the absence of instability, should not be treated with fusion. Two criteria should be met before considering fusion for low back pain: First, the spine should be significantly unstable. Instability exists when one vertebral body slips uncontrollably over another. (This condition is demonstrated by using certain simple X-rays, obtained with the patient bending in various directions.) Second, the patient should have significant pain not treatable by less invasive means than a fusion (medication including narcotics, physical therapy, a short course of epidural steroids, radiofrequency lesions) and the pain should have persisted over a period of six months, despite a serious trial of the above conservative therapy. However, if the above two criteria are met, the diagnosis of discogenic pain becomes irrelevant as the fusion is really being performed to treat pain induced by unstable vertebra surrounding a painful disc. IEN, and its minimally invasive cousins, should only be considered for proven discogenic pain not associated with spinal instability. They are not substitutes for fusion of the lower back if the criteria above are met. Fusions in the neck should be performed for the treatment of certain disc herniations, stenosis, or to treat certain cases of spinal instability. Neck pain alone is not a good reason to undergo fusion. Most neck pain without arm pain is due to sore facets or painful muscles. Unfortunately fusion is an overused surgical treatment for an overly diagnosed disorder–discogenic pain. Up to 50% of lumbar or low back fusions are performed for discogenic pain. Of those undergoing this type of surgery, a third may suffer from chronic pain and disability, at least 10% will need subsequent surgery within 5-7 years and, depending on the academic study reporting results, 30%-70% of patients who undergo this type of surgery do not return to work. Fusion surgery is not only ineffective in relieving back pain in a large number of patients, but in all too many patients produces more pain, albeit of a different quality, than patients had before surgery. However, it is reimbursed by third party payers—and the reimbursement is not in any way linked to patient outcome postoperatively. Do you wonder why our healthcare system is in trouble?